We would like to emphasize that the monthly newsletter can not live without the contributions of FlightGear users and developers. Everyone with a wiki account (free to register) can edit the newsletter and every contribution is welcome. So if you know about any FlightGear related news or projects such as for example updated scenery or aircraft, please do feel invited to add such news to the newsletter. Core developers are encouraged to add news about their latest work to the newsletter's development section and the changelog of the upcoming release. At the end of each month, it's generally a good idea to get in touch with other contributors to ask them to add news about their contributions to the newsletter. Following the release plan, the FlightGear repositories will close for major changes on June 17. In this "frozen" state, no new features or major changes shall be pushed onto the development streams (neither source nor data). This period is for preparing the code for the release and make sure there are no major issues. It lasts for four weeks until creation of the release branches on July 17. It's a good idea for aircraft developers to adhere to this rule. However, aircraft in fgdata may be handled as an exception from the frozen state. Any change to aircraft may be pushed to the repository if it is guaranteed that this change does not affect any other aircraft or system and if no file outside the root directory of that specific aircraft is changed. Also, aircraft defined as part of the base package (e.g. the c172p) enter the frozen state and shall not undergo major changes in that period. See Aircraft Checklists for the main article about this subject. Stuart has pushed a further enhancement to the checklist feature. Aircraft authors may now add one or more <binding> elements to a checklist <item>. Conceptually, these are the actions that the user should execute to complete the item. The checklist GUI displays items with such <binding> elements with an additional [>] button. 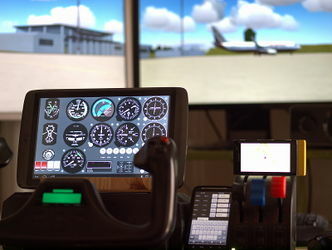 Clicking on the button executes the bindings, allowing the user to watch as the computer/co-pilot/instructor executes the checklist item. Due to the power of Nasal and properties, this feature only required 13 lines of code to write, most of which is displaying the button! The <binding> element is exactly as you would expect - so property-assign, nasal etc. works. It's a good moment to highlight the property-interpolate command which provides a very convenient way to interpolate a property to a new value. See $FG_ROOT/Docs/README.commands if you were unaware of this. The Cessna 172P has been updated to use this feature, including some rather cute interpolations of the throttle, mixture and trim controls. Stuart is planning to extend this function so that checklists with one or more items containing a <binding> element can have an (optional) button to execute the entire checklist. See Transponder for the main article about this subject. Clement (with some help from Vivian and large contribution from James) has overhauled the transponder instrument, making it easier to use from panels, supporting Mode-S altitude encoding, and sending the important properties over multi-player. This will allow more realistic ATC interactions, since id (squawk) codes now matter! See this wiki page for more information on installing / updating the transponder installation in aircraft. The common panel-mounted KT-70 instrument has gotten an overhaul to use the updated C++ code. You can adjust the transponder settings for any aircraft via the Equipment > Radio Settings dialog. OpenRadar has been updated in order to manage the new transponder code. A number of Mac users have been reporting issues related to running Project Rembrandt (deferred rendering/shadows) on Mac OSX with ATI/AMD GPUS, we are now looking for Mac users to provide feedback on running Rembrandt on Mac OSX, required information includes errors and warnings shown during startup/runtime, but also screen shots showing any issues. Please see: Project Rembrandt#Mac Issues. The shortcomings of our old PUI-based GUI have been repeatedly brought up on the mailing list over the years. In order to eventually phase out PUI completely, we need to stop adding PUI dependencies to the source tree. We now have the Canvas system, and there's a formal decision to modernize the GUI using the Canvas, and completely replace PUI sooner rather than later. It was a lot of work to get rid of hard-coded PUI dialogs, and we still have a bunch of hard-coded PUI widgets – as long as we have those, getting totally rid of PUI will be increasingly difficult, because each hard-coded widget will either need to be phased out or manually ported. Which is exactly the reason why adding additional PUI widgets to the source tree is a really bad idea and counter-constructive to accomplish our long-term goal of phasing out PUI completely. This is why we now have a dedicated tutorial about porting our old custom PUI widgets to make use of the Canvas system: Canvas GUI. Core developers are requested not to add any new PUI widgets to the source tree, but instead help identify shortcomings of the existing Canvas/Nasal interface, so that it can be accordingly extended, in order to allow custom widgets to be specified outside C++ space - which can usually be quickly accomplished using the cppbind framework. If you have been wanting to play around with the new Canvas system, make sure to check out the Howto:Adding a canvas to a GUI dialog tutorial, which demonstrates how to easily add a canvas rendering region to a conventional FlightGear dialog. Using the combination of Nasal scripting, standard FlightGear GUI dialogs and embedded canvas regions for 2D rendering, you can even create standalone "FlightGear applications" in the form of self-contained FlightGear XML dialogs that you can easily share with fellow FlightGear users. 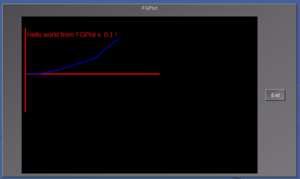 This can for example be used to create a plotting application like FGPlot (see below), which would look to FlightGear like a conventional dialog. kuifje09 has started a little Linux project creating a plotter program for use with creating/tuning the autopilot in FlightGear. See FGPlot for more infomration and a download link. Unfortunately, most of the active FG developers are currently very overstretched in terms of the areas that they have ownership of, which is affecting how much can actually be done. Fundamentally we need more core devs. If you are interested in contributing as a core developer, please see Howto:Start core development. Enjoy the awesome international FlightGear community and experiment the dream to fly with the best Free Flight Simulation Software ever built. With more than 15 years of experience FlightGear has a wide user community, from professionals to normal users from all around the world. For sure you'll find good friends in this amazing virtual community. The FlightGear Wiki still needs help for translating it into various languages. If you are interested in making the FlightGear Wiki multi-language then start at Help:Translate. Das FlightGear Wiki benötigt immer noch Hilfe bei der Übersetzung in verschiedene Sprachen. Wenn Du Interesse daran hast, das FlightGear Wiki Mehrsprachig zu machen, dann fang doch mit Help:Übersetzen an. La FlightGear wiki todavía necesita ayuda para traducirla a varios lenguajes. Si estás interesado en hacer la FlightGear wiki multilingüe, entonces comienza en Help:Traducir. 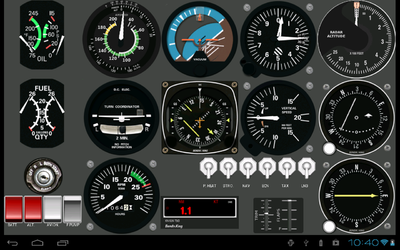 FlightGearMap, an Android application bringing live FlightGear data to your phone, has received an extensive update. Several new instruments were added, including an altitude radar, HSI and RMI. Besides that some basic switches like the magnetos and starter have been implemented. And finally two all new panels come with this release: a Cessna 337 Skymaster panel and a communications panel where you can adjust your radio settings. The app is avialable from Google Play. DutchPilotMitchell has been working on making the scenery around the Caribbean more interesting. It is fictional, none of the placed models is actually there in real life. The reason why he made this was just about making a nice looking and fun area to fly (or drive!!). You can make up your own 'missions'. For example, the people who work at the radar station are injured and need a medevac with a helicopter to bring them to the hospital quickly. Or there is a party in a small town, but they have nothing to drink. Fly to the scotch distillery and bring them drinks. As you can see there are countless things you can do on these islands. Especially after more islands get updated. The only limit is just your imagination. It is really nice flying around with detailled scenery beneath you. There are lots of places to explore. Here are a few features: there is are a few naval ships around, roads with cars on them, railways with trains and train stations, lots of small villages to explore, a WWII airport with F6F Hellcats and B17 bombers, harbours and industrial areas, radar stations and more! It is worth downloading and flying around the place, especially with friends! Imagine doing a helicopter mission with other pilots or a sightseeing tour. On the forums you'll find more pictures of all this and also you'll find a regularly updated download link. Pittsburgh, Pennsylvania is one of the most iconic places in American history. Rick Ace has started modeling parts of city, and Pittsburgh International Airport. The Frick Building has almost been completed too. You can watch his progress in the flightgear forums. FlightGear Virtual Aviation Organization - www.flightgearvao.org - We are an organization that has multiplayer events, ATC service and training for both pilots and ATC alike! We are currently seeking staff members and pilots, so join today! Some new web tools help planning ATC events are in development. They was initiated by lenny64 who announced on the official forum on Apr 27, 2013 that he had the first version of a web site, lenny64.free.fr, that made it possible to see and plan ATC sessions at some of the airports in Europe. Since then it have become possible too file flights to some of them. He later announced that similar functionality was added by evilslut to his tracker and mpserver, mpserver12. To learn more about how the project works, please see this short essay written by Thorsten, for a more detailed article see How the FlightGear project works. This page was last modified on 1 June 2013, at 14:29.